Following on from my last post, here’s another in my series of confusing, annoying or just‐plain‐baffling error messages. Rrrrrright. Last time I looked, 1.2 was, in fact, smaller than 1.5. I think Apple may have spent too much time hanging out with mobile telephone companies recently. Maybe Verizon not knowing dollars from cents, or O2’s strange definition of “unlimited” are rubbing off on Apple’s math skills. Anyway, what am I meant to do at this point? If it thinks it needs minus 0.3Gb before it’ll back up my data, how much space do I need to free up? As it turns out, none. 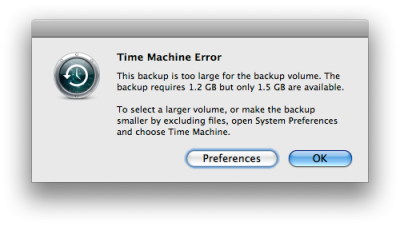 I didn’t do a thing, I just pressed the “OK” button, and Time Machine has successfully been backing up my machine to the very same drive every hour ever since.